if your vehicle is not equipped with a wiring connection for hooking up your trailer and a CURT custom wiring harness is not available for your specific vehicle, we offer taillight converters as a splice-in alternative. Working tail lights on your trailer are absolutely essential any time you tow, and a taillight converter provides an effective way to properly equip your vehicle for safe towing. A converter provides a trailer wiring connector on your vehicle by slicing into the vehicle’s electrical system. They are designed to splice directly into the taillight wiring, rather than plugging into an existing socket. 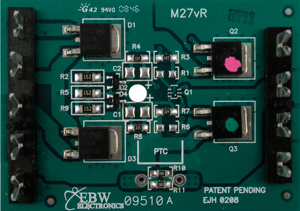 Surface mount technology is the most advanced technology for circuit designs, offering a number of benefits over the older through-hole-mount circuit boards. We apply SMT to most of our taillight converters and custom wiring. For increased quality and reliability, select CURT taillight converters feature a potted enclosure. The converter is filled with an epoxy resin that completely seals off the circuit board and gives the converter several advantages. Vehicles today use different wiring systems to carry out electrical functions, specifically for taillights, stop or brake lights and turn signals. As vehicles have advanced, these wiring systems have changed. To provide a proper wiring connection for towing a trailer, often times an electrical converter is needed. Below are the common wiring systems used in vehicles today, as well as the types of converters used. The two-wire system is the simplest form of vehicle and trailer wiring and is still used by some vehicles today. 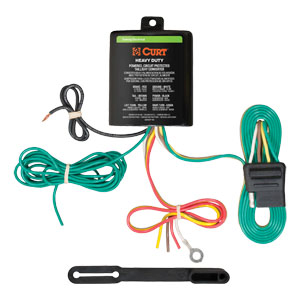 This system sends the stop and turn signals along one wire, and the taillight signal along a second wire. The three-wire system is the most common in the automotive industry. It sends the stop, taillight and turn signals along three separate wires. Vehicles with this system usually require a converter. More and more vehicles today use a PWM (pulse width modulation) system. Sometimes called a 'multiplex', this type of wiring is able to control multiple lighting functions through a single wire by varying the signal intensity. PWM systems can use incandescent or LED lights. There are generally two types: ST systems and STT systems. The ST system (stop / tail) uses a single wire to control the stop and taillight signals. Separate wires are used to control the left and right turn signals. The STT system (stop / turn / tail) uses a single wire to control all three lighting functions: the stop or brake lights, turn signals and taillights.